Batman confronts some button men in a warehouse. They’re obviously protecting something, but what? Some thugs break away in a car, but Batman is with them. At the last minute, one of the thugs throws a red book into the ocean. Later, Gordon’s men retrieve the book, but it’s ruined. Gordon and Batman discuss the importance of possessing that book, as it contains information damaging to mob boss Rupert Thorne. Batman heads to Thorne’s mansion, we he sneaks in, taking down goons one by one. At last, Thorne appears at the top of stairs, backed by several gunzels. Batman tells Thorne he knows Thorne keeps a second copy of the book. Thorne says Batman is right, and the book is in a car, leaving the grounds. Batman cleverly escapes, and chases after the escaping car. He runs the car off the road, and retrieves the book. Gordon and D.A. Dent use it to indict Thorne, though they know the mob boss will get off. Another delightful issue! I wouldn’t have thought watching Batman sneak through a mansion room by room would translate well on the page, but it does. 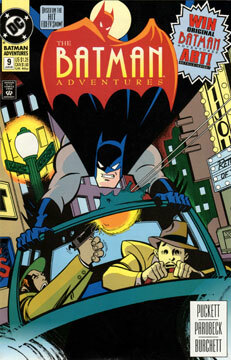 And seeing Batman take on the mob, with no colorful rogues in sight, is always a breath of fresh air. And Thorne is a fun, underused character. Parobeck continues his reign! A true sign of a master is that every incidental character is completely unique and distinctive. Every one of these goons has a personality, and Parobeck made that obvious in just a few frames every time. Lots of mobsters, and Thorne in a smoking jacket.